modellauto18.de - The 1/18 Modelcar Shop! all articles in our shop are in stock, except for novelties (tagged "Neuheit" in the picture). 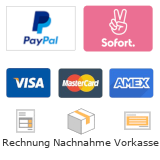 Place your order by credit card or paypal express from monday to friday before 14:00 and your order will be shipped the same day (for orders shipped with DHL).